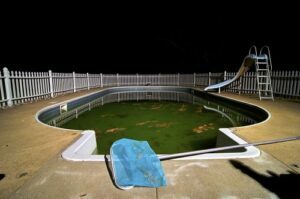 A green pool is very unsightly and is often a sign of neglect. Often it occurs from the result of an unfortunate attempt to save money over winter, with the pool pump being switched off and regular pool maintenance suspended. However, without the constant movement of water throughout the day, algae and bacteria soon start to grow and develop in the pool water. It all begins with the swimming pool losing its sparkling water and following on, it will turn from blue to green. 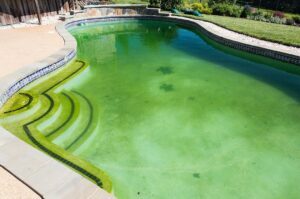 To the untrained eye, a green pool may not cause much concern, yet this tells us that algae and bacteria are starting to take over which also means the pool is very unsafe to swim in. A slightly green pool can turn much worse very quickly. If left untreated the pool water quickly becomes very cloudy and the colour darkens as the algae takes over. A dark green pool can then turn black, depending on conditions. Further to the unsightly appearance, bugs and rodents can start to hide in the dark water. Bugs, frogs and even snakes can find their way into a dark pool and can easily take refuge unseen! Some people don’t worry about their pool going green or black over winter as they are not using it anyway, however when the weather starts heating up again they quickly reach for help and want to use their pool again. Depending on how bad things are we may be able to recover your pool with a green pool treatment over a few visits. 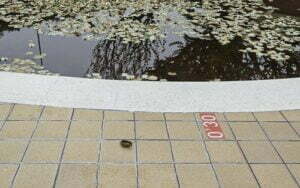 On the first visit we will inspect to make sure we can go ahead with a green pool treatment as opposed to a full drain and clean (for the more extreme cases). Our first step is to treat the water with chemicals and leave it to take effect. This process can take up to a few days to fully settle things. The treatment will kill the live algae and bacteria causing it to sink to the bottom of your pool. On the second visit we need to remove the sunken algae and clean out any other foreign material in the pool. Depending on the condition, during the second visit we may be able to get your pool back to normal, occasionally another visit may be required. Once your green pool has been cleared of all the dead algae and has had a thorough clean, the chemical levels are tested and any additional products are added to bring the levels back to safe and harmonious levels. 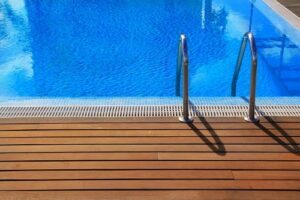 If your pool has gone beyond a green colour and is now black, this is a sign it has been neglected for a long period of time and usually has lots of leaves, branches and other foreign matter in it. A simple treatment may not be enough to bring it back to life. In these extreme cases we may need to completely drain your swimming pools water. This is so we can physically get in the pool to remove all the debris from the pools floor. This approach also allows us to conduct a thorough clean by blasting the walls and pool interior with a pressure gun. Once this is complete, we can refill your pool with fresh water and adjust the chemicals to leave it re-balanced, fresh and new again. As you can see there is a lot of work involved in both instances to recover a green pool or black pool. As detailed above both methods work great, but the condition of the pool will determine if we can succeed with a simple treatment or have to take more extreme action by draining and refilling. At the end of the day we will get your swimming pool back to crystal clear and safe swimming conditions. However, we strongly urge all of our clients to run their pumps during winter and follow a regular pool maintenance schedule all year round to ensure that you do not have to go through the hassle of either one of these processes when summer comes around again. If you have unfortunately inherited this problem there is something you can do about it. Give us a call and we can recover your pool and have it ready for you to enjoy. Please note these processes take time to get your green pool back to a safe condition for swimming. Plan ahead and don’t book any pool parties until your pool has had adequate time to be treated or fully drained, cleaned and refilled. Speak to us for more information and check out our other services here. We are experts are recovering green and even black pools and transforming them back to crystal clear blue. Copyright © 2014-2019 easternsuburbspoolcleaner.com All Rights Reserved.